Apollo 16, Thunderbolt audio interface from Universal Audio in the Apollo series. Product replaced by the Universal Audio Apollo 16 MkII. Universal Audio will debut today at Musikmesse the new version of its Apollo audio interface which offers 16 channels of analogue I/O. The Apollo 16 is a FireWire/Thunderbolt (with optional card) 24-bit / 192kHz audio interface designed to work with Mac OS X and Windows 7 64-bit (with a compatible PCIe-to-FireWire adapter on PC). It provides 16 analogue inputs and outputs on DB-25 connectors and real time UAD-2 QUAD processing which allows for fast recording and mixing thanks to the UAD-Powered plug-ins. 4 Stereo Cue inputs are also present with assignable outputs, along with stereo AES/EBU inputs and XLR outputs dedicated to monitoring. Other features include the PT mode for integrating external analogue devices into Pro Tools or the Virtual I/O for real time processing of UAD virtual instruments from you DAW tracks. The Apollo 16 ships with the "Analog Classics" plug-ins (LA-2A Classic Audio Leveler, 1176N Limiting Amplifier and Pultec EQP-1A) and the Console Recall plug-in (VST, RTAS and AU) which allows for instant loading of the interface parameter from the DAW session. Last, the Apollo 16 audio interface is compatible with the UAD-2 DSP accelerator cards and it's possible to cascade two Apollo 16 via MADI and process up to 32 channels of I/O. 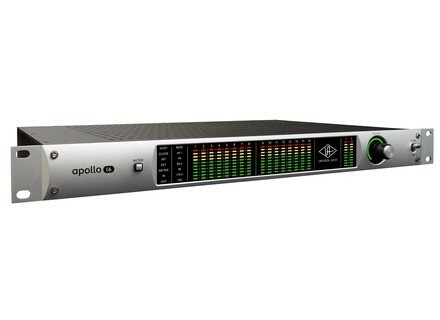 The Universal Audio Apollo 16 audio interface will be available during Q2, 2013, at an estimated public price of $2999. The optional Thunderbolt card will retail for $499. More info at www.uaudio.com/apollo. [Musikmesse] SPL introduces Crimson SPL will also unveil tomorrow in Frankfurt the Crimson USB audio interface and monitoring controller, which can handle up to 30 channels. [Musikmesse] U-he unveils new modules U-he will attend Musikmesse where he will unveil the Diva update, Bazille 1.0 and Satin virtual synths and effects. [Musikmesse] U-he and Amazona Tyrell N6 v3 U-he and Amazona.de announce the availability of the third version of their Tyrell N6 free virtual synthesizer.